"Whatever else, indeed, a "ghost" may be, it is probably one of the most complex phenomena in nature. " Throughout the world, there are many different hotels that are rumored to be haunted. International hotel hauntings are among the most intriguing of all ghost stories due to the fact that so many different people from different locations around the world experience the unexplained phenomenon that occurs within the structures. While the United States has several haunted hotels, it has been established among paranormal investigators and others that they do not hold the monopoly on the paranormal occurrences that occur in these structures. The world, as a whole, has a tremendous amount of history. It comes as no surprise that there are several international hotel hauntings. It has been established that ghosts are literally everywhere – every continent, every country, every state, and in just about every city worldwide. Every region of the world has its own haunted buildings, scary houses, and creepy cemeteries. It has been established that every region of the world has its own number of haunted hotels. Legends of unexplained phenomenon and paranormal events are quite powerful and are quickly relayed from one individual to another. This is especially true when it comes to legends and stories pertaining to hotels worldwide. Such a vast number of individuals experience these powerful spirits that the stories are quickly passed and a paranormal legend is quickly set into place. While many international haunted hotels have a number of stories around them pertaining to the paranormal and it can often be challenging to distinguish fact from fiction, it is important to know and understand that there is a fact behind each and every tale of scary spiritual encounter, problematic poltergeist, and other unexplained phenomenon. The hotel hauntings highlighted throughout this section at Haunted Places to Go distinguish characteristics and lessons about our past, it reminds us that we are never truly alone in the world, and that there is a future beyond that of death. If you have a haunted hotel story to share with us, be sure to submit your story below. We would love to hear from you! If you would like to keep up with what's new at Haunted Places To Go and receive a free ghost hunting guide,then be sure to sign up below for our newsletter! I promise to use it only to send you The Haunted Places To Go Extra!. 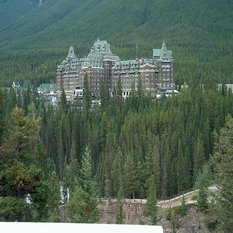 There is a particular room in the Banff Springs Hotel that has been considered to be haunted for several years. 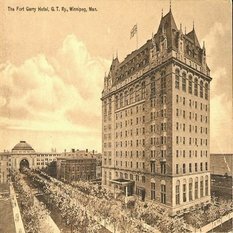 The haunted history of the Fort Garry Hotel is very appealing to those that reside and live in Winnipeg, Manitoba Canada. 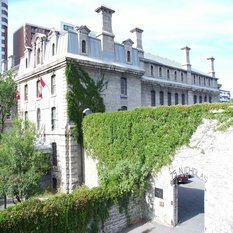 While the prison closed its doors in the year of 1972, to date, it is believed to be one of the most haunted structures in all of Canada. Recently, the Poltergeist Society provided this hotel with the award of being the most haunted hotel in Great Britain for a second time. There are many unique witness accounts and stories surrounding this particular establishment. Have You Stayed in one of the World’s Most Haunted Hotels? Have you had a paranormal experience while staying in a hotel? Did you see, hear, or feel something that you couldn't find a logical explanation for? If so, we want to hear from you! Share your haunted hotel story with our readers by providing as many details as possible and upload any photos you wish to share.